With dyed blond hair and a hostile resting face, Imamura is finally graduating from his high school as Again Vol 1 opens. He transferred to the high school three years previously but had neither made friends nor joined a club. Imamura has also made no plans for his future career or schooling after high school ends. After the graduation ceremony, Imamura is thinking about the Ouendan (pep) club that he could have joined but didn’t. When he tries to climb through a window into the old Ouendan club room, he is seen by Akira, who is meeting her boyfriend. When Akira sees Imamura, she runs in fear and trips down a staircase. Imamura also trips and lands on top of her, knocking them both out. Imamura wakes up with his mother calling him to go to school. He realizes that it is three years earlier and he is reliving his entire high school career. He realizes that this is his chance to make better choices including joining the Ouendan. Akira’s tale is also told but in less detail. While berating Imamura for forcing her to fall down the stairs, she accidently joins the Ouendan too. The rest of the novel addresses typical high school rivalries and romances. The cover artwork using pastels and watercolors is beautiful. The interior art uses cross hashing to make various shades of gray. However, the drawings appear somewhat muddled. There is nothing within the plot to mark it as original. 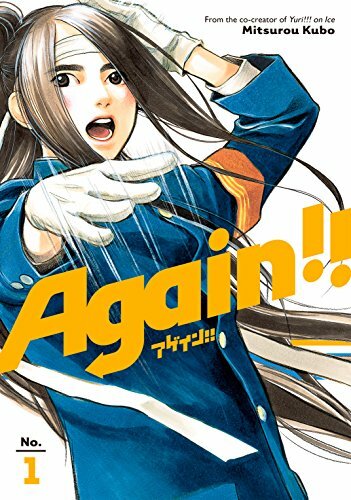 The abrupt end of Again Vol 1 forces me to give this volume 3 stars. Hopefully, Vol 2 will have a more complete story. Thanks to the publisher, Kodansha Comics, and NetGalley for an egalley.